When Ben told me we were going to take his mom out for Mother’s Day Brunch, I thought he was crazy. 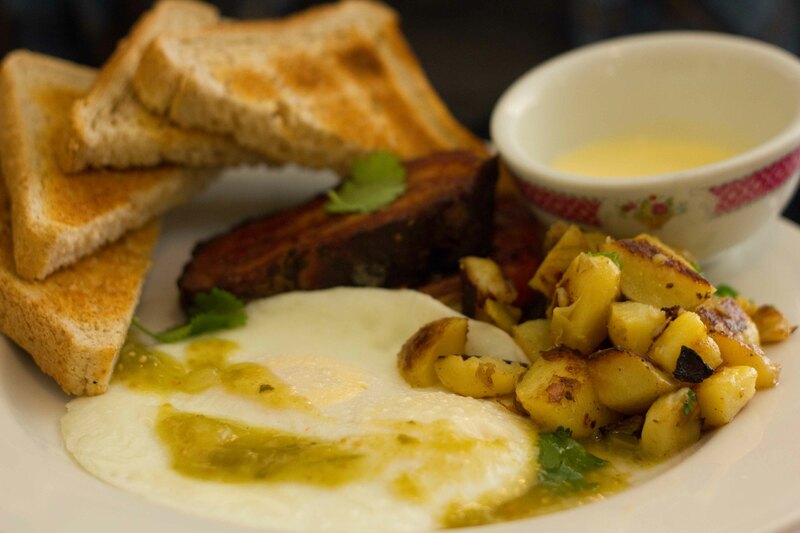 Dining out for Mother’s Day Brunch is pretty much as silly as going out for Valentine’s Dinner or New Years Eve at a bar; too much hype and too crowded. I’d much prefer to put my efforts into a home-cooked meal and save the going out for a regular day. But I was told the brunch was my mother-in-law Jo wanted, so of course I’d agree to it for her. What I didn’t realize then, but quickly came to understand, was that the request had more to do with my father-in-law, Henry. Luckily the food was so good, that no one could hold it against him. Located in the on the verge of being trendy, Sunrise neighbourhood (E Hastings at Nanaimo) the Red Wagon Cafe just had a great write-up by Alexandra Gill in the Globe and Mail. The review was filled with glorious adjectives and Gill swooned over the pulled pork pancakes. I was worried about having to wait in a line-up for Mother’s Day brunch, but we arrived at opening and were seated right away. There were a lot of good choices on the menu and I vowed not to order my “regular” order of 2 eggs, crispy bacon and hash browns. The chicken chilaquiles and pulled pork bennys looked good but I thought both may be a bit heavy considering I had a dragon boat practice right after the brunch. 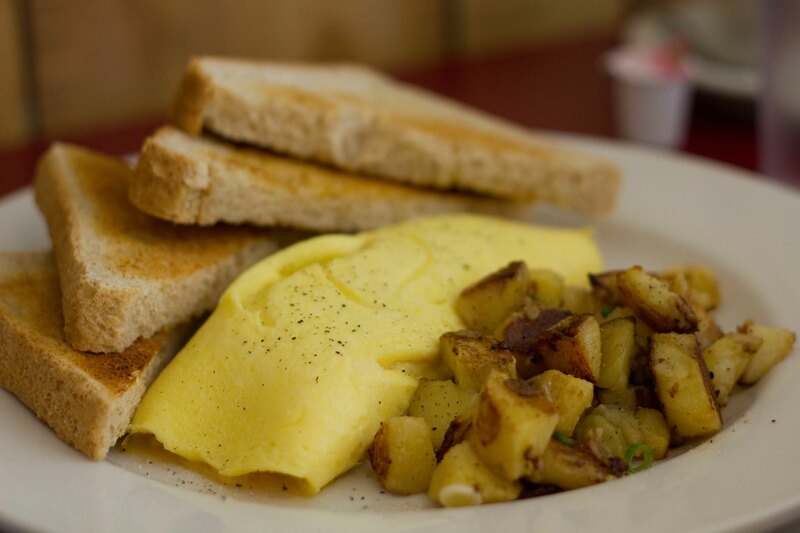 I was eying the special of the day – duck confit omelette with caramelized onions and Swiss cheese but was skeptical about how the Swiss cheese would taste with the duck confit. I decided to trust that the chef should know best and went for it. After reading some reviews about undercooked potatoes, I asked for mine to crispy just to be sure. The omelette was fluffy, the bits of duck confit were delicious with the sweet caramelized onions and the Swiss cheese complimented wonderfully. It’s hard to see pork belly confit on the menu without ordering it, but seeing as I had to paddle right after lunch so I knew better than to try it. Luckily Henry did, so I got to taste it. Not the most luscious pork belly I’ve ever had, a little bit on the dry side and the hint of Chinese 5 spice powder was a surprise that my palate didn’t really appreciate. Ben ordered the real hit of the meal. I couldn’t eat a whole plate of it, but I hope if I return that anyone I came with would order it so I could steal a bite or two. 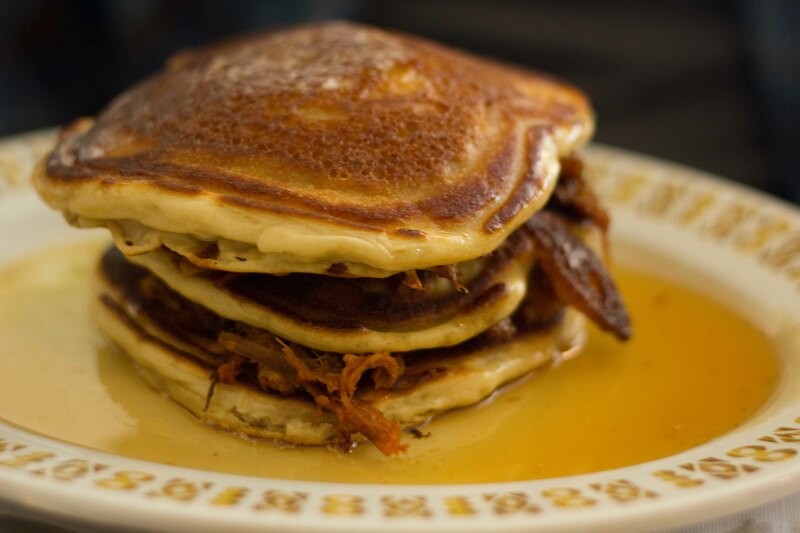 Pulled pork layered between fluffy pancakes smothered in Jack Daniels maple syrup. The perfect combination of savoury and sweet. Hi Susy, hope you are enjoying the playoff run! Loved your post-I have a hard time ordering anything other than my “regular” breakfast (2 eggs OE, toast, bacon and HB as well). Went out to breakfast last week, just brennan (my 10 year old) and I. He ordered peanut butter and bacon on toast with maple syrup. I think he would be all over the pulled pork pancakes at this place! Loving the playoff run, although it’s pretty stressful! Peanut butter and bacon on toast with maple syrup sounds like a dream come true for me. Going to have to try it soon.